Betting on golf is actually a lot more popular among American sports fans than some may guess. Some feel that Tiger Woods helped propel the sport of golf to a more mainstream following, attracting fans that previously did not have much interest in the sport. Whatever the reason, legal golf betting is in high demand and garners the attention of leading oddsmakers. It is because of the growing momentum of betting on golf that we have created a guide for those in the United States seeking legally licensed and regulated US friendly golf betting destinations. 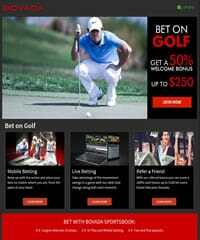 The gambling landscape for US players can be a tricky one, and having accurate and up to date resources regarding the legalities involved in betting on golf and access to legally sanctioned betting sites that accept American players are two components that can keep you on the legal side of betting and ensure an enjoyable and high quality experience. In addition to discussion the legal status of betting on golf in the US, this page also looks at how to read and interpret the odds and what major tournaments and events are prominent in the global golf circuit. Is betting on golf legal in the US? There are numerous elements that impact the legal status of betting on golf for American sports bettors. US federal laws play a role in what opportunities are available to US residents, as does the location of the sportsbook business that you are considering bringing your action to. The state in which you reside can even play a part in determining what is and is not legal for you as a gambler (check to see if online gambling is legal in your state). We decided to break it all down for you so that there is no guessing involved and that your course of action comes down to a highly informed decision based on the facts. All the facts are not pretty and wrapped up with a nice bow, but some of them do lean in your favor. Please keep In mind that if you are searching for a definitive legal response to any questions you may have, you should contact an attorney. There are three primary federal laws which directly impact USA online sports betting and gambling in general for United States Residents: the Federal Wire Act, the Professional and Amateur Sports Protection Act (PASPA), and the Unlawful Internet Gambling Enforcement Act (UIGEA). Each one addresses a different segment of the US legal gambling market, and we address each one individually in our USA gambling laws section. To be honest, all of the sportsbooks we recommend to players are extremely reputable. However Bovada seems to be the players choice due to their incredible sports betting interface, generous rewards and fast payouts. Below are a few of the reasons why Bovada is #1 for millions of players. By and large, Americans have a very odd relationship with golf. It hasn't earned its placement as a top-four sport in the American landscape, but it ironically cleans up for the oddsmakers. This means while golf might not be exciting enough to earn the same types of sponsors as the NFL or NBA, it is popular enough to exchange billions of dollars in bets every single year. Golf certainly has its stars and its high points. While Tiger Woods has fallen from prominence of late, he is still one of the world's most recognizable sporting figures. There are dozens of professional tours every year, and four Major Championships in golf. Before you decide to bet on the sport, however, it's important to learn how to stack the betting odds in your favor. You might be tempted to place a wad of cash down on Tiger Woods or Bubba Watson in any given tournament, but when you're going against the entire field, this is something known in gambling as "dead money." It basically means the odds are well out of your favor; it would be akin to picking only one horse on a 30-horse track, or one driver in a NASCAR race. There just isn't any sense in it, in the sense that you don't have the odds in your favor. Instead, look at different betting options in golf. Let's say that the men are playing on Pebble Beach and you know that Watson typically shoots 5 under part on the back nine there. Well, you don't have to extend your betting past this point. You can find plenty of sites on which you can bet on strictly the back nine, or the front nine, or any single round of three or four rounds. You can even find prop bets for individual holes. So, say Watson's going up against a par 5 on 15, and you know this is one of his best holes. You might be able to bet that he shoots under par and clean up on a bet. You can also enter into a four-player set-up known as Acey-Duecy, or you can find head-to-head match-ups with other gamblers. The great thing here is that you can approach this like a card game; e.g. look for gamblers who don't know a lot about golf, and take advantage of their poor betting habits to increase your odds of winning the matches. The idea is to look around for different bet types that put the odds in your favor. Find something where you're betting only on portions of games or only on individual holes. Try to steer clear of anything that requires you to bet an entire tournament. It's just too risky. To discuss the top golf tournaments in America, you don't have to look any farther than the four Major Championships. Taking place in April, the Masters Tournament is an invitation only tournament played at the Augusta National Golf Club in Georgia. The tournament was started by Bobby Jones, one of the most famous golfers ever, and it consists of four, 18-hole rounds and golfers have their scores calculated after 36 holes to see if they've made the cut to continue. After the final two days of play, a winner is crowned and given a green jacket. We just put up a new legal Masters golf betting section to help guide players about the legalities of betting on the Masters, and which sportsbooks are the top rated. Open to professionals and amateurs alike, who make the cut, the U.S. Open is another famous PGA tournament. Unlike the Masters, the Open is played on a new course every year, and it consists of four 18-hole rounds. However, a new 18-hole round is held in the event of a tie, rather than a few holes to break it. It is certainly one of the most prestigious tournaments in the world. Although held in the UK and called the British Open, the Open Championship is still technically a PGA tour and thus under the purview of America. It has been played since 1860, and it is considered one of the most difficult courses on which to play. An incredibly large tournament, over 150 golfers are invited to participate in the Open Championship. Taking place around Labor Day weekend, the PGA Championship is the last of the major four on tour for the golfers. Started in 1916, we're quickly coming up on the 100 year anniversary of this stellar tournament, and like the Open Championship, over 150 golfers are invited to participate. It's a typical four-round tournament like the rest, but the cuts are harsher and the field is quickly thinned. When betting on golf, remember to keep things smaller so that you'll remain in control. Try to bet on holes and with other players, rather than betting on single golfers to win an entire tournament.